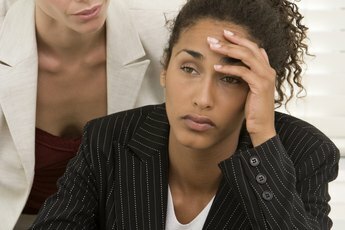 Do co-workers the courtesy of listening when they speak. Unless you work alone on a remote, uninhabited island -- or in a home office -- you need to be able to get along with co-workers for at least eight hours a day. While having a job is one of the major symbols of adulthood, getting along with co-workers relies heavily on the basics you learned as a kid: common courtesy, the golden rule and using your "inside voice." These go a long way to keep your workplace functioning smoothly and a pleasant place to be. The common courtesies you learned when younger are still relevant as an adult. Simple things such as saying "please," "thank you" and "excuse me" keep things civil and respectful in the office. Don't just limit these pleasantries to your peers, either. Use them with everyone from the garage attendant to the janitor to the senior manager. Showing respect to the people you work with makes it a lot more likely they'll respect you in return. And don't forget things like holding the door open for someone or helping pick up the mess when someone drops an armload of papers. Think about how frustrated you get when you're waiting on a client's response to complete a project. You wish he'd get back to you now so you can get on with your work. Translate that into how you respond to others. Return phone calls and emails promptly. If you say you'll get your part of the team report to your co-worker by Wednesday, don't start working on it at 4 p.m. Wendesday. Get to meetings on time; otherwise you send the rude and unwelcome message that your time is more valuable than the folks already there. Part of working with others is sharing space with them. Even if you don't know your co-workers well, do right by each other by cleaning up after yourself in the break room and not leaving personal items in the bathroom. And while it's common to add a personal touch or two to your own desk or cubicle, leave the 152-piece ceramic cat collection at home. Even if you have your own office, it's still part of a professional workplace. This means a small framed photo of your family is fine, but a life-size poster of your favorite movie hunk is not. For people who've grown up with social media, chat rooms and instant messaging, it's easy to forget that not everyone wants to know all your personal details. This is especially true in the workplace, where it's important to keep boundaries between your work persona and your life outside the office. Your co-workers didn't ask to become your BFFs, so keep your personal phone calls quiet and to a minimum. Don't prattle on about your love life, your latest medical problems or the cute guy at the gym. 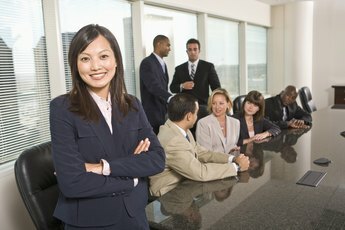 Share a little info to get to know your co-workers, but avoid the "I didn't need to know that about her" lines of discussion. You don't have to like all the people you work with, but life at the office will go more smoothly if you make the effort to get along. Be pleasant and polite. Treat people with respect, whether you're just chatting in the break room or attending a major staff meeting. Show up on time, follow the company dress code and finish your work on time. If you remember the old line on the report card that said, "works and plays well with others," remember that you still get "graded" on that at work, only it's described as cooperating, sharing workloads, helping co-workers as needed and being dependable.